The High Availability Add-On is a clustered system that provides reliability, scalability, and availability to critical production services. A cluster is two or more computers (called nodes or members) that work together to perform a task. Clusters can be used to provide highly available services or resources. The redundancy of multiple machines is used to guard against failures of many types. Cluster administration tools — Configuration and management tools for setting up, configuring, and managing the High Availability Add-On. The tools are for use with the cluster infrastructure components, the high availability and service management components, and storage. LVM Locking Daemon (lvmlockd) — Part of the Resilient Storage Add-On, this provides volume management of cluster storage. lvmlockd support also requires cluster infrastructure. Pacemaker is a cluster resource manager. It achieves maximum availability for your cluster services and resources by making use of the cluster infrastructure’s messaging and membership capabilities to deter and recover from node and resource-level failure. A cluster configured with Pacemaker comprises separate component daemons that monitor cluster membership, scripts that manage the services, and resource management subsystems that monitor the disparate resources. STONITH is the Pacemaker fencing implementation. It acts as a cluster resource in Pacemaker that processes fence requests, forcefully powering down nodes and removing them from the cluster to ensure data integrity. STONITH is configured in the CIB and can be monitored as a normal cluster resource. For a general overview of fencing, see Section 1.3, “Fencing overview”. Uses the kronosnet library as its network transport to provide multiple redundant links and automatic failover. The High Availability Add-On features two configuration tools for cluster deployment, monitoring, and management. A graphical user interface to create and configure Pacemaker/Corosync clusters. The configuration files for the Red Hat High Availability Add-On are corosync.conf and cib.xml. The corosync.conf file provides the cluster parameters used by corosync, the cluster manager that Pacemaker is built on. In general, you should not edit the corosync.conf directly but, instead, use the pcs or pcsd interface. However, there may be a situation where you do need to edit this file directly. The cib.xml file is an XML file that represents both the cluster’s configuration and the current state of all resources in the cluster. This file is used by Pacemaker’s Cluster Information Base (CIB). The contents of the CIB are automatically kept in sync across the entire cluster. Do not edit the cib.xml file directly; use the pcs or pcsd interface instead. If communication with a single node in the cluster fails, then other nodes in the cluster must be able to restrict or release access to resources that the failed cluster node may have access to. This cannot be accomplished by contacting the cluster node itself as the cluster node may not be responsive. Instead, you must provide an external method, which is called fencing with a fence agent. 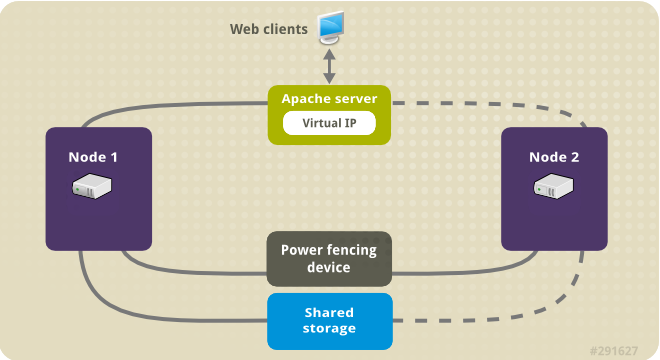 A fence device is an external device that can be used by the cluster to restrict access to shared resources by an errant node, or to issue a hard reboot on the cluster node. Without a fence device configured you do not have a way to know that the resources previously used by the disconnected cluster node have been released, and this could prevent the services from running on any of the other cluster nodes. Conversely, the system may assume erroneously that the cluster node has released its resources and this can lead to data corruption and data loss. Without a fence device configured data integrity cannot be guaranteed and the cluster configuration will be unsupported. When the fencing is in progress no other cluster operation is allowed to run. Normal operation of the cluster cannot resume until fencing has completed or the cluster node rejoins the cluster after the cluster node has been rebooted. For more information about fencing, see Fencing in a Red Hat High Availability Cluster. For example, in a 6-node cluster, quorum is established when at least 4 cluster nodes are functioning. If the majority of nodes go offline or become unavailable, the cluster no longer has quorum and Pacemaker stops clustered services. A Red Hat Enterprise Linux High Availability Add-On cluster uses the votequorum service, in conjunction with fencing, to avoid split brain situations. A number of votes is assigned to each system in the cluster, and cluster operations are allowed to proceed only when a majority of votes is present. A cluster resource is an instance of program, data, or application to be managed by the cluster service. These resources are abstracted by agents that provide a standard interface for managing the resource in a cluster environment. To ensure that resources remain healthy, you can add a monitoring operation to a resource’s definition. If you do not specify a monitoring operation for a resource, one is added by default. ordering constraints — An ordering constraint determines the order in which the resources run. The following procedures provide an introduction to the tools and processes you use to create a Pacemaker cluster. They are intended for users who are interested in seeing what the cluster software looks like and how it is administered, without needing to configure a working cluster. These procedures do not create a supported Red Hat cluster, which requires at least two nodes and the configuration of a fencing device. This example requires a single node running RHEL 8 and it requires a floating IP address that resides on the same network as the statically assigned IP address for that node. The node used in this example is z1.example.com. The floating IP address used in this example is 192.168.122.120. Ensure that the name of the node on which you are running is in your /etc/hosts file. By working through this procedure, you will learn how to use Pacemaker to set up a cluster, how to display cluster status, and how to configure a cluster service. This example creates an Apache HTTP server as a cluster resource and shows how the cluster responds when the resource fails. Install the Red Hat High Availability Add-On software packages from the High Availability channel, and start and enable the pcsd service. If you are running the firewalld daemon, enable the ports that are required by the Red Hat High Availability Add-On. Set a password for user hacluster on each node in the cluster and authenticate user hacluster for each node in the cluster on the node from which you will be running the pcs commands. This example is using only a single node, the node from which you are running the commands, but this step is included here since it is a necessary step in configuring a supported Red Hat High Availability multi-node cluster. Create a cluster named my_cluster with one member and check the status of the cluster. This command creates and starts the cluster in one step. A Red Hat High Availability cluster requires that you configure fencing for the cluster. The reasons for this requirement are described in Fencing in a Red Hat High Availability Cluster. For this introduction, however, which is intended to show only how to use the basic Pacemaker commands, disable fencing by setting the stonith-enabled cluster option to false. The use of stonith-enabled=false is completely inappropriate for a production cluster. It tells the cluster to simply pretend that failed nodes are safely powered off. Configure a web browser on your system and create a web page to display a simple text message. If you are running the firewalld daemon, enable the ports that are required by httpd. Do not use systemctl enable to enable any services that will be managed by the cluster to start at system boot. In order for the Apache resource agent to get the status of Apache, create the following addition to the existing configuration to enable the status server URL. Create IPaddr2 and apache resources for the cluster to manage. The 'IPaddr2' resource is a floating IP address that must not be one already associated with a physical node. If the 'IPaddr2' resource’s NIC device is not specified, the floating IP must reside on the same network as the statically assigned IP address used by the node. In this example, the IP address resource and the apache resource are both configured as part of a group named apachegroup, which ensures that the resources are kept together to run on the same node when you are configuring a working multi-node cluster. After you have configured a cluster resource, you can use the pcs resource config command to display the options that are configured for that resource. Point your browser to the website you created using the floating IP address you configured. This should display the text message you defined. Stop the apache web service and check the cluster status. Using killall -9 simulates an application-level crash. Check the cluster status. You should see that stopping the web service caused a failed action, but that the cluster software restarted the service and you should still be able to access the website. You can clear the failure status on the resource that failed once the service is up and running again and the failed action notice will no longer appear when you view the cluster status. When you are finished looking at the cluster and the cluster status, stop the cluster services on the node. Even though you have only started services on one node for this introduction, the --all parameter is included since it would stop cluster services on all nodes on an actual multi-node cluster. This procedure provides an introduction to creating a Pacemaker cluster running a service that will fail over from one node to another when the node on which the service is running becomes unavailable. By working through this procedure, you can learn how to create a service in a two-node cluster and you can then observe what happens to that service when it fails on the node on which it running. This example procedure configures a two-node Pacemaker cluster running an Apache HTTP server. You can then stop the Apache service on one node to see how the service remains available. This procedure requires as a prerequisite that you have two nodes running Red Hat Enterprise Linux 8 that can communicate with each other, and it requires a floating IP address that resides on the same network as the statically assigned IP addresses for the nodes. The nodes used in this example are z1.example.com and z2.example.com. Ensure that the names of the nodes you are using are in the /etc/hosts file on each node. On both nodes, install the Red Hat High Availability Add-On software packages from the High Availability channel, and start and enable the pcsd service. If you are running the firewalld daemon, on both nodes enable the ports that are required by the Red Hat High Availability Add-On. On both nodes in the cluster, set a password for user hacluster . Authenticate user hacluster for each node in the cluster on the node from which you will be running the pcs commands. Create a cluster named my_cluster with both nodes as cluster members. This command creates and starts the cluster in one step. You only need to run this from one node in the cluster because pcs configuration commands take effect for the entire cluster. On one node in cluster, run the following command. After creating a cluster and disabling fencing, check the status of the cluster. When you run the pcs cluster status command, it may show output that temporarily differs slightly from the examples as the system components start up. On both nodes, configure a web browser and create a web page to display a simple text message. If you are running the firewalld daemon, enable the ports that are required by httpd. In order for the Apache resource agent to get the status of Apache, on each node in the cluster create the following addition to the existing configuration to enable the status server URL. In this example, the IP address resource and the apache resource are both configured as part of a group named apachegroup, which ensures that the resources are kept together to run on the same node. Note that in this instance, the apachegroup service is running on node z1.example.com. Access the website you created, stop the service on the node on which it is running, and note how the service fails over to the second node. Point a browser to the website you created using the floating IP address you configured. This should display the text message you defined, displaying the name of the node on which the website is running. Stop the apache web service. Using killall -9 simulates an application-level crash. Check the cluster status. You should see that stopping the web service caused a failed action, but that the cluster software restarted the service on the node on which it had been running and you should still be able to access the web browser. Clear the failure status once the service is up and running again. Put the node on which the service is running into standby mode. Note that since we have disabled fencing we can not effectively simulate a node-level failure (such as pulling a power cable) because fencing is required for the cluster to recover from such situations. Check the status of the cluster and note where the service is now running. Access the website. There should be no loss of service, although the display message should indicate the node on which the service is now running. To restore cluster services to the first node, take the node out of standby mode. This will not necessarily move the service back to that node. For final cleanup, stop the cluster services on both nodes. The following procedure creates a Red Hat High Availability two-node cluster using pcs. After you have created a cluster, you can configure the resources and resource groups that you require. Alternatively, you can install the Red Hat High Availability Add-On software packages along with only the fence agent that you require with the following command. The following command displays a listing of the available fence agents. The ideal firewall configuration for cluster components depends on the local environment, where you may need to take into account such considerations as whether the nodes have multiple network interfaces or whether off-host firewalling is present. The example here, which opens the ports that are generally required by a Pacemaker cluster, should be modified to suit local conditions. Enabling ports for the High Availability Add-On shows the ports to enable for the Red Hat High Availability Add-On and provides an explanation for what each port is used for. Before the cluster can be configured, the pcsd daemon must be started and enabled to start up on boot on each node. This daemon works with the pcs command to manage configuration across the nodes in the cluster. You must configure a fencing device for each node in the cluster. For information about the fence configuration commands and options, see Configuring fencing in a Red Hat High Availability cluster. For general information on fencing and its importance in a Red Hat High Availability cluster, see Fencing in a Red Hat High Availability Cluster. After configuring your fence device, you should test the device. For information on testing a fence device, see Testing a fence device. The following procedure configures an active/passive Apache HTTP server in a two-node Red Hat Enterprise Linux High Availability Add-On cluster using pcs to configure cluster resources. In this use case, clients access the Apache HTTP server through a floating IP address. The web server runs on one of two nodes in the cluster. If the node on which the web server is running becomes inoperative, the web server starts up again on the second node of the cluster with minimal service interruption. Figure 4.1, “Apache in a Red Hat High Availability Two-Node Cluster” shows a high-level overview of the cluster. The cluster is a two-node Red Hat High Availability cluster which is configured with a network power switch and with shared storage. The cluster nodes are connected to a public network, for client access to the Apache HTTP server through a virtual IP. The Apache server runs on either Node 1 or Node 2, each of which has access to the storage on which the Apache data is kept. A two-node Red Hat High Availability cluster with power fencing configured for each node. This procedure uses the cluster example provided in Creating a Red Hat High-Availability cluster with Pacemaker. Configure an ext4 file system on the logical volume my_lv. After performing these procedures, you create the resource group and the resources it contains. The following procedure creates an LVM logical volume and then creates an ext4 file system on that volume for use in a Pacemaker cluster. In this example, the shared partition /dev/sdb1 is used to store the LVM physical volume from which the LVM logical volume will be created. On both nodes of the cluster, perform the following steps to set the value for the LVM system ID to the value of the uname for the system. The LVM system ID will be used to ensure that only the cluster is capable of activating the volume group. Set the system_id_source configuration option in the /etc/lvm/lvm.conf configuration file to uname. Verify that the LVM system ID on the node matches the uname for the node. Create the LVM volume and create an ext4 file system on that volume. Since the /dev/sdb1 partition is storage that is shared, you perform this part of the procedure on one node only. Verify that the new volume group has the system ID of the node on which you are running and from which you created the volume group. Create a web page for Apache to serve up. On one node in the cluster, mount the file system you created in Configuring an LVM volume with an ext4 file system, create the file index.html on that file system, and then unmount the file system. An LVM resource named my_lvm that uses the LVM volume group you created in Configuring an LVM volume with an ext4 file system. A Filesystem resource named my_fs, that uses the file system device /dev/my_vg/my_lv you created in Configuring an LVM volume with an ext4 file system. An IPaddr2 resource, which is a floating IP address for the apachegroup resource group. The IP address must not be one already associated with a physical node. If the IPaddr2 resource’s NIC device is not specified, the floating IP must reside on the same network as the statically assigned IP addresses used by the cluster nodes, otherwise the NIC device to assign the floating IP address cannot be properly detected. An apache resource named Website that uses the index.html file and the Apache configuration you defined in Configuring an Apache HTTP server. The following command creates the LVM resource my_lvm. Because the resource group apachegroup does not yet exist, this command creates the resource group. Do not configure more than one LVM-activate resource that uses the same LVM volume group in an active/passive HA configuration, as this risks data corruption. Additionally, do not configure an LVM-activate resource as a clone resource in an active/passive HA configuration. Note that if you have not configured a fencing device for your cluster by default the resources do not start. If you find that the resources you configured are not running, you can run the pcs resource debug-start resource command to test the resource configuration. In the cluster status display shown in Creating the resources and resource groups, all of the resources are running on node z1.example.com. You can test whether the resource group fails over to node z2.example.com by using the following procedure to put the first node in standby mode, after which the node will no longer be able to host resources. Removing a node from standby mode does not in itself cause the resources to fail back over to that node. The following procedure configures a highly available active/passive NFS server on a two-node Red Hat Enterprise Linux High Availability Add-On cluster using shared storage. The procedure uses pcs to configure Pacemaker cluster resources. In this use case, clients access the NFS file system through a floating IP address. The NFS server runs on one of two nodes in the cluster. If the node on which the NFS server is running becomes inoperative, the NFS server starts up again on the second node of the cluster with minimal service interruption. Configuring a highly available active/passive NFS server on an existing two-node Red Hat Enterprise Linux High Availability cluster requires that you perform the following steps. Configure an ext4 file system on the LVM logical volume my_lv on the shared storage for the nodes in the cluster. Configure an NFS share on the shared storage on the LVM logical volume. Test the NFS server you have configured. Mount the ext4 file system that you created in Configuring an LVM volume with an ext4 file system on the /nfsshare directory. It is recommended that when you create a cluster resource with the pcs resource create, you execute the pcs status command immediately afterwards to verify that the resource is running. Note that if you have not configured a fencing device for your cluster, by default the resources do not start. If you find that the resources you configured are not running, you can run the pcs resource debug-start resource command to test the resource configuration. This starts the service outside of the cluster’s control and knowledge. At the point the configured resources are running again, run pcs resource cleanup resource to make the cluster aware of the updates. The following command creates the LVM-activate resource named my_lvm. Because the resource group nfsgroup does not yet exist, this command creates the resource group. The following command configures an ext4 Filesystem resource named nfsshare as part of the nfsgroup resource group. This file system uses the LVM volume group and ext4 file system you created in Configuring an LVM volume with an ext4 file system and will be mounted on the /nfsshare directory you created in Configuring an NFS share. A node that is unresponsive may still be accessing data. The only way to be certain that your data is safe is to fence the node using STONITH. STONITH is an acronym for "Shoot The Other Node In The Head" and it protects your data from being corrupted by rogue nodes or concurrent access. Using STONITH, you can be certain that a node is truly offline before allowing the data to be accessed from another node. For more complete general information on fencing and its importance in a Red Hat High Availability cluster, see Fencing in a Red Hat High Availability Cluster. You implement STONITH in a Pacemaker cluster by configuring fence devices for the nodes of the cluster. Use the following command to view of list of all available STONITH agents. When you specify a filter, this command displays only the STONITH agents that match the filter. Use the following command to view the options for the specified STONITH agent. For example, the following command displays the options for the fence agent for APC over telnet/SSH. For fence agents that provide a method option, a value of cycle is unsupported and should not be specified, as it may cause data corruption. The following command creates a stonith device. For additional available options, see the pcs stonith -h display. If you use a single fence device for several nodes, using a different port of each node, you do not need to create a device separately for each node. Instead you can use the pcmk_host_map option to define which port goes to which node. For example, the following command creates a single fencing device called myapc-west-13 that uses an APC power switch called west-apc and uses port 15 for node west-13. The following example, however, uses the APC power switch named west-apc to fence nodes west-13 using port 15, west-14 using port 17, west-15 using port 18, and west-16 using port 19. After configuring a fence device, it is imperative that you test the device to ensure that it is working correctly. For information on testing a fence device, see Testing a fence device. You can disable a fencing device by running the pcs stonith disable stonith_id command. This will prevent any node from using that device. To prevent a specific node from using a fencing device, you can configure location constraints for the fencing resource with the pcs constraint location …​ avoids command. Configuring stonith-enabled=false will disable fencing altogether. Note, however, that Red Hat does not support clusters when fencing is disabled, as it is not suitable for a production environment. Table 6.1, “General Properties of Fencing Devices” describes the general properties you can set for fencing devices. A list of machines controlled by this device (Optional unless pcmk_host_check=static-list). Table 6.2, “Advanced Properties of Fencing Devices” summarizes additional properties you can set for fencing devices. Note that these properties are for advanced use only. An alternate parameter to supply instead of port. Some devices do not support the standard port parameter or may provide additional ones. Use this to specify an alternate, device-specific parameter that should indicate the machine to be fenced. A value of none can be used to tell the cluster not to supply any additional parameters. An alternate command to run instead of reboot. Some devices do not support the standard commands or may provide additional ones. Use this to specify an alternate, device-specific, command that implements the reboot action. Specify an alternate timeout to use for reboot actions instead of stonith-timeout. Some devices need much more/less time to complete than normal. Use this to specify an alternate, device-specific, timeout for reboot actions. The maximum number of times to retry the reboot command within the timeout period. Some devices do not support multiple connections. Operations may fail if the device is busy with another task so Pacemaker will automatically retry the operation, if there is time remaining. Use this option to alter the number of times Pacemaker retries reboot actions before giving up. An alternate command to run instead of off. Some devices do not support the standard commands or may provide additional ones. Use this to specify an alternate, device-specific, command that implements the off action. Specify an alternate timeout to use for off actions instead of stonith-timeout. Some devices need much more or much less time to complete than normal. Use this to specify an alternate, device-specific, timeout for off actions. The maximum number of times to retry the off command within the timeout period. Some devices do not support multiple connections. Operations may fail if the device is busy with another task so Pacemaker will automatically retry the operation, if there is time remaining. Use this option to alter the number of times Pacemaker retries off actions before giving up. An alternate command to run instead of list. Some devices do not support the standard commands or may provide additional ones. Use this to specify an alternate, device-specific, command that implements the list action. Specify an alternate timeout to use for list actions instead of stonith-timeout. Some devices need much more or much less time to complete than normal. Use this to specify an alternate, device-specific, timeout for list actions. The maximum number of times to retry the list command within the timeout period. Some devices do not support multiple connections. Operations may fail if the device is busy with another task so Pacemaker will automatically retry the operation, if there is time remaining. Use this option to alter the number of times Pacemaker retries list actions before giving up. An alternate command to run instead of monitor. Some devices do not support the standard commands or may provide additional ones. Use this to specify an alternate, device-specific, command that implements the monitor action. Specify an alternate timeout to use for monitor actions instead of stonith-timeout. Some devices need much more or much less time to complete than normal. Use this to specify an alternate, device-specific, timeout for monitor actions. The maximum number of times to retry the monitor command within the timeout period. Some devices do not support multiple connections. Operations may fail if the device is busy with another task so Pacemaker will automatically retry the operation, if there is time remaining. Use this option to alter the number of times Pacemaker retries monitor actions before giving up. An alternate command to run instead of status. Some devices do not support the standard commands or may provide additional ones. Use this to specify an alternate, device-specific, command that implements the status action. Specify an alternate timeout to use for status actions instead of stonith-timeout. Some devices need much more or much less time to complete than normal. Use this to specify an alternate, device-specific, timeout for status actions. The maximum number of times to retry the status command within the timeout period. Some devices do not support multiple connections. Operations may fail if the device is busy with another task so Pacemaker will automatically retry the operation, if there is time remaining. Use this option to alter the number of times Pacemaker retries status actions before giving up. Enable a base delay for stonith actions and specify a base delay value. This prevents double fencing when different delays are configured on the nodes. Use this to enable a static delay for stonith actions. The overall delay is derived from a random delay value adding this static delay so that the sum is kept below the maximum delay. Enable a random delay for stonith actions and specify the maximum of random delay. This prevents double fencing when using slow devices such as SBD. Use this to enable a random delay for stonith actions. The overall delay is derived from this random delay value adding a static delay so that the sum is kept below the maximum delay. The maximum number of actions that can be performed in parallel on this device. The cluster property concurrent-fencing=true needs to be configured first. A value of -1 is unlimited. For advanced use only: An alternate command to run instead of on. Some devices do not support the standard commands or may provide additional ones. Use this to specify an alternate, device-specific, command that implements the on action. For advanced use only: Specify an alternate timeout to use for on actions instead of stonith-timeout. Some devices need much more or much less time to complete than normal. Use this to specify an alternate, device-specific, timeout for on actions. For advanced use only: The maximum number of times to retry the on command within the timeout period. Some devices do not support multiple connections. Operations may fail if the device is busy with another task so Pacemaker will automatically retry the operation, if there is time remaining. Use this option to alter the number of times Pacemaker retries on actions before giving up. Fencing is a fundamental part of the Red Hat Cluster infrastructure and it is therefore important to validate or test that fencing is working properly. Use the following procedure to test a fence device. Use ssh, telnet, HTTP, or whatever remote protocol is used to connect to the device to manually log in and test the fence device or see what output is given. For example, if you will be configuring fencing for an IPMI-enabled device, then try to log in remotely with ipmitool. Take note of the options used when logging in manually because those options might be needed when using the fencing agent. If you are unable to log in to the fence device, verify that the device is pingable, there is nothing such as a firewall configuration that is preventing access to the fence device, remote access is enabled on the fencing device, and the credentials are correct. Run the fence agent manually, using the fence agent script. This does not require that the cluster services are running, so you can perform this step before the device is configured in the cluster. This can ensure that the fence device is responding properly before proceeding. The examples in this section use the fence_ilo fence agent script for an iLO device. The actual fence agent you will use and the command that calls that agent will depend on your server hardware. You should consult the man page for the fence agent you are using to determine which options to specify. You will usually need to know the login and password for the fence device and other information related to the fence device. The following example shows the format you would use to run the fence_ilo fence agent script with -o status parameter to check the status of the fence device interface on another node without actually fencing it. This allows you to test the device and get it working before attempting to reboot the node. When running this command, you specify the name and password of an iLO user that has power on and off permissions for the iLO device. The following example shows the format you would use to run the fence_ilo fence agent script with the -o reboot parameter. Running this command on one node reboots another node on which you have configured the fence agent. If the fence agent failed to properly do a status, off, on, or reboot action, you should check the hardware, the configuration of the fence device, and the syntax of your commands. In addition, you can run the fence agent script with the debug output enabled. The debug output is useful for some fencing agents to see where in the sequence of events the fencing agent script is failing when logging into the fence device. When diagnosing a failure that has occurred, you should ensure that the options you specified when manually logging in to the fence device are identical to what you passed on to the fence agent with the fence agent script. For fence agents that support an encrypted connection, you may see an error due to certificate validation failing, requiring that you trust the host or that you use the fence agent’s ssl-insecure parameter. Similarly, if SSL/TLS is disabled on the target device, you may need to account for this when setting the SSL parameters for the fence agent. If the fence agent that is being tested is a fence_drac, fence_ilo, or some other fencing agent for a systems management device that continues to fail, then fall back to trying fence_ipmilan. Most systems management cards support IPMI remote login and the only supported fencing agent is fence_ipmilan. Once the fence device has been configured in the cluster with the same options that worked manually and the cluster has been started, test fencing with the pcs stonith fence command from any node (or even multiple times from different nodes), as in the following example. The pcs stonith fence command reads the cluster configuration from the CIB and calls the fence agent as configured to execute the fence action. This verifies that the cluster configuration is correct. If the pcs stonith fence command works properly, that means the fencing configuration for the cluster should work when a fence event occurs. If the command fails, it means that cluster management cannot invoke the fence device through the configuration it has retrieved. Check for the following issues and update your cluster configuration as needed. Check your fence configuration. For example, if you have used a host map you should ensure that the system can find the node using the host name you have provided. Check whether the password and user name for the device include any special characters that could be misinterpreted by the bash shell. Making sure that you enter passwords and user names surrounded by quotation marks could address this issue. Check whether you can connect to the device using the exact IP address or host name you specified in the pcs stonith command. For example, if you give the host name in the stonith command but test by using the IP address, that is not a valid test. If the protocol that your fence device uses is accessible to you, use that protocol to try to connect to the device. For example many agents use ssh or telnet. You should try to connect to the device with the credentials you provided when configuring the device, to see if you get a valid prompt and can log in to the device. If you determine that all your parameters are appropriate but you still have trouble connecting to your fence device, you can check the logging on the fence device itself, if the device provides that, which will show if the user has connected and what command the user issued. You can also search through the /var/log/messages file for instances of stonith and error, which could give some idea of what is transpiring, but some agents can provide additional information. Once the fence device tests are working and the cluster is up and running, test an actual failure. To do this, take an action in the cluster that should initiate a token loss. Take down a network. How you take a network depends on your specific configuration. In many cases, you can physically pull the network or power cables out of the host. Disabling the network interface on the local host rather than physically disconnecting the network or power cables is not recommended as a test of fencing because it does not accurately simulate a typical real-world failure. Block corosync traffic both inbound and outbound using the local firewall. Simulate a crash and panic your machine with sysrq-trigger. Note, however, that triggering a kernel panic can cause data loss; it is recommended that you disable your cluster resources first. Pacemaker supports fencing nodes with multiple devices through a feature called fencing topologies. To implement topologies, create the individual devices as you normally would and then define one or more fencing levels in the fencing topology section in the configuration. Each level is attempted in ascending numeric order, starting at 1. If a device fails, processing terminates for the current level. No further devices in that level are exercised and the next level is attempted instead. If all devices are successfully fenced, then that level has succeeded and no other levels are tried. Use the following command to add a fencing level to a node. The devices are given as a comma-separated list of stonith ids, which are attempted for the node at that level. The following command lists all of the fencing levels that are currently configured. In the following example, there are two fence devices configured for node rh7-2: an ilo fence device called my_ilo and an apc fence device called my_apc. These commands set up fence levels so that if the device my_ilo fails and is unable to fence the node, then Pacemaker will attempt to use the device my_apc. This example also shows the output of the pcs stonith level command after the levels are configured. The following command removes the fence level for the specified node and devices. If no nodes or devices are specified then the fence level you specify is removed from all nodes. The following command clears the fence levels on the specified node or stonith id. If you do not specify a node or stonith id, all fence levels are cleared. If you specify more than one stonith id, they must be separated by a comma and no spaces, as in the following example. The following command verifies that all fence devices and nodes specified in fence levels exist. You can specify nodes in fencing topology by a regular expression applied on a node name and by a node attribute and its value. For example, the following commands configure nodes node1, node2, and `node3 to use fence devices apc1 and `apc2, and nodes `node4, node5, and `node6 to use fence devices apc3 and `apc4. When configuring fencing for redundant power supplies, the cluster must ensure that when attempting to reboot a host, both power supplies are turned off before either power supply is turned back on. If the node never completely loses power, the node may not release its resources. This opens up the possibility of nodes accessing these resources simultaneously and corrupting them. You need to define each device only once and to specify that both are required to fence the node, as in the following example. # pcs stonith create apc1 fence_apc_snmp ipaddr=apc1.example.com login=user passwd='7a4D#1j!pz864' pcmk_host_map="node1.example.com:1;node2.example.com:2"
# pcs stonith create apc2 fence_apc_snmp ipaddr=apc2.example.com login=user passwd='7a4D#1j!pz864' pcmk_host_map="node1.example.com:1;node2.example.com:2"
The following command shows all currently configured fence devices. If a stonith_id is specified, the command shows the options for that configured stonith device only. If the --full option is specified, all configured stonith options are displayed. Use the following command to modify or add options to a currently configured fencing device. Use the following command to remove a fencing device from the current configuration. You can fence a node manually with the following command. If you specify --off this will use the off API call to stonith which will turn the node off instead of rebooting it. In a situation where no stonith device is able to fence a node even if it is no longer active, the cluster may not be able to recover the resources on the node. If this occurs, after manually ensuring that the node is powered down you can enter the following command to confirm to the cluster that the node is powered down and free its resources for recovery. If the node you specify is not actually off, but running the cluster software or services normally controlled by the cluster, data corruption/cluster failure will occur. To disable a fencing device/resource, you run the pcs stonith disable command. The following command disables the fence device myapc. To prevent a specific node from using a fencing device, you can configure location constraints for the fencing resource. The following example prevents fence device node1-ipmi from running on node1. If a cluster node is configured to be fenced by an integrated fence device, disable ACPI Soft-Off for that node. Disabling ACPI Soft-Off allows an integrated fence device to turn off a node immediately and completely rather than attempting a clean shutdown (for example, shutdown -h now). Otherwise, if ACPI Soft-Off is enabled, an integrated fence device can take four or more seconds to turn off a node (see the note that follows). In addition, if ACPI Soft-Off is enabled and a node panics or freezes during shutdown, an integrated fence device may not be able to turn off the node. Under those circumstances, fencing is delayed or unsuccessful. Consequently, when a node is fenced with an integrated fence device and ACPI Soft-Off is enabled, a cluster recovers slowly or requires administrative intervention to recover. The preferred way to disable ACPI Soft-Off is to change the BIOS setting to "instant-off" or an equivalent setting that turns off the node without delay, as described in Section 6.13.1, “Disabling ACPI Soft-Off with the BIOS”. Setting HandlePowerKey=ignore in the /etc/systemd/logind.conf file and verifying that the node node turns off immediately when fenced, as described in Section 6.13.2, “Disabling ACPI Soft-Off in the logind.conf file”. This is the first alternate method of disabling ACPI Soft-Off. Appending acpi=off to the kernel boot command line, as described in Section 6.13.3, “Disabling ACPI completely in the GRUB 2 File”. This is the second alternate method of disabling ACPI Soft-Off, if the preferred or the first alternate method is not available. At the Power menu, set the Soft-Off by PWR-BTTN function (or equivalent) to Instant-Off (or the equivalent setting that turns off the node by means of the power button without delay). BIOS CMOS Setup Utility: shows a Power menu with ACPI Function set to Enabled and Soft-Off by PWR-BTTN set to Instant-Off. Verify that the node turns off immediately when fenced. For information on testing a fence device, see Testing a fence device. To disable power-key handing in the /etc/systemd/logind.conf file, use the following procedure. You can disable ACPI Soft-Off by appending acpi=off to the GRUB menu entry for a kernel. When you specify the --group option, the resource is added to the resource group named. If the group does not exist, this creates the group and adds this resource to the group. The --before and --after options specify the position of the added resource relative to a resource that already exists in a resource group. Specifying the --disabled option indicates that the resource is not started automatically. You can determine the behavior of a resource in a cluster by configuring constraints for that resource. The following command creates a resource with the name VirtualIP of standard ocf, provider heartbeat, and type IPaddr2. The floating address of this resource is 192.168.0.120, and the system will check whether the resource is running every 30 seconds. For example, the following command deletes an existing resource with a resource ID of VirtualIP. The properties that you define for a resource tell the cluster which script to use for the resource, where to find that script and what standards it conforms to. Table 7.1, “Resource Properties”, describes these properties. Table 7.2, “Commands to Display Resource Properties” summarizes the commands that display the available resource properties. Displays a list of all available resources. Displays a list of available resource agent standards. Displays a list of available resource agent providers. Displays a list of available resources filtered by the specified string. You can use this command to display resources filtered by the name of a standard, a provider, or a type. For any individual resource, you can use the following command to display a description of the resource, the parameters you can set for that resource, and the default values that are set for the resource. For example, the following command displays information for a resource of type apache. This is the resource agent for the Apache Web server. In addition to the resource-specific parameters, you can configure additional resource options for any resource. These options are used by the cluster to decide how your resource should behave. Table 7.3, “Resource Meta Options” describes the resource meta options. Value to indicate how much the resource prefers to stay where it is. Indicates under what conditions the resource can be started. * nothing - The cluster can always start the resource. * quorum - The cluster can only start this resource if a majority of the configured nodes are active. This is the default value if stonith-enabled is false or the resource’s standard is stonith. * fencing - The cluster can only start this resource if a majority of the configured nodes are active and any failed or unknown nodes have been powered off. * unfencing - The cluster can only start this resource if a majority of the configured nodes are active and any failed or unknown nodes have been powered off and only on nodes that have been unfenced. This is the default value if the provides=unfencing stonith meta option has been set for a fencing device. How many failures may occur for this resource on a node, before this node is marked ineligible to host this resource. A value of 0 indicates that this feature is disabled (the node will never be marked ineligible); by contrast, the cluster treats INFINITY (the default) as a very large but finite number. This option has an effect only if the failed operation has on-fail=restart (the default), and additionally for failed start operations if the cluster property start-failure-is-fatal is false. Used in conjunction with the migration-threshold option, indicates how many seconds to wait before acting as if the failure had not occurred, and potentially allowing the resource back to the node on which it failed. To change the default value of a resource option, use the following command. For example, the following command resets the default value of resource-stickiness to 100. Omitting the options parameter from the pcs resource defaults displays a list of currently configured default values for resource options. The following example shows the output of this command after you have reset the default value of resource-stickiness to 100. Whether you have reset the default value of a resource meta option or not, you can set a resource option for a particular resource to a value other than the default when you create the resource. The following shows the format of the pcs resource create command you use when specifying a value for a resource meta option. For example, the following command creates a resource with a resource-stickiness value of 50. You can also set the value of a resource meta option for an existing resource, group, cloned resource, or master resource with the following command. In the following example, there is an existing resource named dummy_resource. This command sets the failure-timeout meta option to 20 seconds, so that the resource can attempt to restart on the same node in 20 seconds. After executing this command, you can display the values for the resource to verify that failure-timeout=20s is set. One of the most common elements of a cluster is a set of resources that need to be located together, start sequentially, and stop in the reverse order. To simplify this configuration, Pacemaker supports the concept of resource groups. Resources are started in the order in which you specify them. If a resource in the group cannot run anywhere, then no resource specified after that resource is allowed to run. Resources are stopped in the reverse order in which you specify them. The IPaddr is started first, then Email. The Email resource is stopped first, then IPAddr. You remove a resource from a group with the following command. If there are no remaining resources in the group, this command removes the group itself. A resource group inherits the following options from the resources that it contains: priority, target-role, is-managed. For information on resource meta options, see Configuring resource meta options. location constraints — A location constraint determines which nodes a resource can run on. For information on configuring location constraints, see Determining which nodes a resource can run on. order constraints — An ordering constraint determines the order in which the resources run. For information on configuring ordering constraints, see Determining the order in which cluster resources are run. colocation constraints — A colocation constraint determines where resources will be placed relative to other resources. For information on colocation constraints, see Colocating cluster resources. As a shorthand for configuring a set of constraints that will locate a set of resources together and ensure that the resources start sequentially and stop in reverse order, Pacemaker supports the concept of resource groups. After you have created a resource group, you can configure constraints on the group itself just as you configure constraints for individual resources. For information on resource groups, see Configuring resource groups. Location constraints determine which nodes a resource can run on. You can configure location constraints to determine whether a resource will prefer or avoid a specified node. You can configure a basic location constraint to specify whether a resource prefers or avoids a node, with an optional score value to indicate the relative degree of preference for the constraint. The following command creates a location constraint for a resource to prefer the specified node or nodes. Note that it is possible to create constraints on a particular resource for more than one node with a single command. The following command creates a location constraint for a resource to avoid the specified node or nodes. Table 8.1, “Simple Location Constraint Options” summarizes the meanings of the basic options for configuring location constraints. Postive integer value to indicate the preference for whether a resource should prefer or avoid a node. INFINITY is the default score value for a resource location constraint. A value of INFINITY for score in a command that configures a resource to prefer a node indicates that the resource will prefer that node if the node is available, but does not prevent the resource from running on another node if the specified node is unavailable. A value of INFINITY in a command that configures a resource to avoid a node indicates that the resource will never run on that node, even if no other node is available. The following command creates a location constraint to specify that the resource Webserver prefers node node1. pcs supports regular expressions in location constraints on the command line. These constraints apply to multiple resources based on the regular expression matching resource name. This allows you to configure multiple location contraints with a single command line. The following command creates a location constraint to specify that resources dummy0 to dummy9 prefer node1. Since Pacemaker uses POSIX extended regular expressions as documented at http://pubs.opengroup.org/onlinepubs/9699919799/basedefs/V1_chap09.html#tag_09_04, you can specify the same constraint with the following command. When configuring a location constraint on a node, you can use the resource-discovery option of the pcs constraint location command to indicate a preference for whether Pacemaker should perform resource discovery on this node for the specified resource. Limiting resource discovery to a subset of nodes the resource is physically capable of running on can significantly boost performance when a large set of nodes is present. When pacemaker_remote is in use to expand the node count into the hundreds of nodes range, this option should be considered. The following command shows the format for specifying the resource-discovery option of the pcs constraint location command. In this command, a positive value for score corresponds to a basic location constraint that configures a resource to prefer a node, while a negative value for score corresponds to a basic location`constraint that configures a resource to avoid a node. As with basic location constraints, you can use regular expressions for resources with these constraints as well. Table 8.2, “Simple Location Constraint Options” summarizes the meanings of the basic options for configuring location constraints. Table 8.3, “Resource Discovery Values” summarizes the meanings of the values you can specify for the resource-discovery option. Always perform resource discovery for the specified resource on this node. This is the default resource-discovery value for a resource location constraint. Never perform resource discovery for the specified resource on this node. Perform resource discovery for the specified resource only on this node (and other nodes similarly marked as exclusive). Multiple location constraints using exclusive discovery for the same resource across different nodes creates a subset of nodes resource-discovery is exclusive to. If a resource is marked for exclusive discovery on one or more nodes, that resource is only allowed to be placed within that subset of nodes. Note that setting the resource-discovery option to never or exclusive allows the possibility for the resource to be active in those locations without the cluster’s knowledge. This can lead to the resource being active in more than one location if the service is started outside the cluster’s control (for example, by systemd or by an administrator). This can also occur if the resource-discovery property is changed while part of the cluster is down or suffering split-brain, or if the resource-discovery property is changed for a resource and node while the resource is active on that node. For this reason, using this option is appropriate only when you have more than eight nodes and there is a way to guarantee that the resource can run only in a particular location (for example, when the required software is not installed anywhere else). Opt-In Clusters — Configure a cluster in which, by default, no resource can run anywhere and then selectively enable allowed nodes for specific resources. Opt-Out Clusters — Configure a cluster in which, by default, all resources can run anywhere and then create location constraints for resources that are not allowed to run on specific nodes. Whether you should choose to configure your cluster as an opt-in or opt-out cluster depends on both your personal preference and the make-up of your cluster. If most of your resources can run on most of the nodes, then an opt-out arrangement is likely to result in a simpler configuration. On the other hand, if most resources can only run on a small subset of nodes an opt-in configuration might be simpler. To create an opt-in cluster, set the symmetric-cluster cluster property to false to prevent resources from running anywhere by default. Enable nodes for individual resources. The following commands configure location constraints so that the resource Webserver prefers node example-1, the resource Database prefers node example-2, and both resources can fail over to node example-3 if their preferred node fails. When configuring location constraints for an opt-in cluster, setting a score of zero allows a resource to run on a node without indicating any preference to prefer or avoid the node. To create an opt-out cluster, set the symmetric-cluster cluster property to true to allow resources to run everywhere by default. The following commands will then yield a configuration that is equivalent to the example in Section 8.3.1, “Configuring an "Opt-In" Cluster”. Both resources can fail over to node example-3 if their preferred node fails, since every node has an implicit score of 0. Note that it is not necessary to specify a score of INFINITY in these commands, since that is the default value for the score. To determine the order in which the resources run, you configure an ordering constraint. The following shows the format for the command to configure an ordering constraint. Table 9.1, “Properties of an Order Constraint”, summarizes the properties and options for configuring ordering constraints. If no action is specified, the default action is start. * Optional - Only applies if both resources are executing the specified action. For information on optional ordering, see Configuring advisory ordering. * Mandatory - Always (default value). If the first resource you specified is stopping or cannot be started, the second resource you specified must be stopped. For information on mandatory ordering, see Configuring mandatory ordering. A mandatory ordering constraint indicates that the second resource you specify cannot run without the first resource you specify being active. This is the default value of the kind option. Leaving the default value ensures that the second resource you specify will react when the first resource you specify changes state. If the first resource you specified was not running and cannot be started, the second resource you specified will be stopped (if it is running). When the kind=Optional option is specified for an ordering constraint, the constraint is considered optional and only applies if both resources are executing the specified actions. Any change in state by the first resource you specify will have no effect on the second resource you specify. A common situation is for an administrator to create a chain of ordered resources, where, for example, resource A starts before resource B which starts before resource C. If your configuration requires that you create a set of resources that is colocated and started in order, you can configure a resource group that contains those resources, as described in Configuring resource groups. In these situations, you can create an ordering constraint on a set or sets of resources with the pcs constraint order set command. action, which can be set to start, promote, demote or stop, as described in Properties of an Order Constraint. score, to indicate the degree of preference for this constraint. For information on this option, see Simple Location Constraint Options. To specify that the location of one resource depends on the location of another resource, you configure a colocation constraint. Another thing to keep in mind when creating colocation constraints is that, assuming resource A is colocated with resource B, the cluster will also take into account resource A’s preferences when deciding which node to choose for resource B. Table 10.1, “Properties of a Colocation Constraint”, summarizes the properties and options for configuring colocation constraints. Mandatory placement occurs any time the constraint’s score is +INFINITY or -INFINITY. In such cases, if the constraint cannot be satisfied, then the source_resource is not permitted to run. For score=INFINITY, this includes cases where the target_resource is not active. You may have a resource C that must be colocated with either resource A or B, but there is no relationship between A and B.
role, which can be set to Stopped, Started, Master, or Slave. kind, to indicate how to enforce the constraint. There are a several commands you can use to display constraints that have been configured. The following command lists all current location, order, and colocation constraints. The following command lists all current location constraints. If resources is specified, location constraints are displayed per resource. This is the default behavior. If nodes is specified, location constraints are displayed per node. If specific resources or nodes are specified, then only information about those resources or nodes is displayed. The following command lists all current ordering constraints. If the --full option is specified, show the internal constraint IDs. The following command lists all current colocation constraints. If the --full option is specified, show the internal constraint IDs. The following command lists the constraints that reference specific resources. For more complicated location constraints, you can use Pacemaker rules to determine a resource’s location. Determines how the value(s) should be tested. Allowed values: string, integer, version. The default value is string. In addition to any attributes added by the administrator, the cluster defines special, built-in node attributes for each node that can also be used, as described in Table 12.3, “Built-in Node Attributes”. Node type. Possible values are cluster, remote, and container. The value of kind is remote for Pacemaker Remote nodes created with the ocf:pacemaker:remote resource, and container for Pacemaker Remote guest nodes and bundle nodes. The role the relevant promotable clone has on this node. Valid only within a rule for a location constraint for a promotable clone. Date expressions are used to control a resource or cluster option based on the current date/time. They can contain an optional date specification. Date specifications are used to create cron-like expressions relating to time. Each field can contain a single number or a single range. Instead of defaulting to zero, any field not supplied is ignored. For example, monthdays="1" matches the first day of every month and hours="09-17" matches the hours between 9 am and 5 pm (inclusive). However, you cannot specify weekdays="1,2" or weekdays="1-2,5-6" since they contain multiple ranges. Allowed values: 0-7 (0 is new, 4 is full moon). Durations are used to calculate a value for end when one is not supplied to in_range operations. They contain the same fields as date_spec objects but without the limitations (that is, you can have a duration of 19 months). Like date_specs, any field not supplied is ignored. Use the following command to configure a Pacemaker constraint that uses rules. If score is omitted, it defaults to INFINITY. If resource-discovery is omitted, it defaults to always. For information on the resource-discovery option, see Resource Discovery Values. As with basic location constraints, you can use regular expressions for resources with these constraints as well. When using rules to configure location constraints, the value of score can be positive or negative, with a positive value indicating "prefers" and a negative value indicating "avoids". The expression option can be one of the following where duration_options and date_spec_options are: hours, monthdays, weekdays, yeardays, months, weeks, years, weekyears, moon as described in Properties of a Date Specification. The following location constraint configures an expression that is true if now is any time in the year 2018. The following command configures an expression that is true from 9 am to 5 pm, Monday through Friday. Note that the hours value of 16 matches up to 16:59:59, as the numeric value (hour) still matches. The following command configures an expression that is true when there is a full moon on Friday the thirteenth. To remove a rule, use the following command. If the rule that you are removing is the last rule in its constraint, the constraint will be removed. In order to perform maintenance on the nodes of your cluster, you may need to stop or move the resources and services running on that cluster. Or you may need to stop the cluster software while leaving the services untouched. Pacemaker provides a variety of methods for performing system maintenance. If you need to stop a node in a cluster while continuing to provide the services running on that cluster on another node, you can put the cluster node in standby mode. A node that is in standby mode is no longer able to host resources. Any resource currently active on the node will be moved to another node, or stopped if no other node is eligible to run the resource. For information on standby mode, see Putting a node into standby mode. If you need to move an individual resource off the node on which it is currently running without stopping that resource, you can use the pcs resource move command to move the resource to a different node. For information on the pcs resource move command, see Manually moving cluster resources. When you execute the pcs resource move command, this adds a constraint to the resource to prevent it from running on the node on which it is currently running. When you are ready to move the resource back, you can execute the pcs resource clear or the pcs constraint delete command to remove the constraint. This does not necessarily move the resources back to the original node, however, since where the resources can run at that point depends on how you have configured your resources initially. You can relocate a resource to a specified node to its preferred node pcs resource relocate run command, as described in Moving a resource to its preferred node. If you need to stop a running resource entirely and prevent the cluster from starting it again, you can use the pcs resource disable command. For information on the pcs resource disable command, see Enabling, disabling, and banning cluster resources. If you want to prevent Pacemaker from taking any action for a resource (for example, if you want to disable recovery actions while performing maintenance on the resource, or if you need to reload the /etc/sysconfig/pacemaker settings), use the pcs resource unmanage command, as described in Setting a resource to unmanaged mode. Pacemaker Remote connection resources should never be unmanaged. If you need to update the packages that make up the RHEL High Availability and Resilient Storage Add-Ons,`you can update the packages on one node at a time or on the entire cluster as a whole, as summariced in Updating a Red Hat Enterprise Linux high availability cluster. If you need to perform maintenance on a Pacemaker remote node, you can remove that node from the cluster by disabling the remote node resource, as described in Upgrading remote nodes and guest nodes. When a cluster node is in standby mode, the node is no longer able to host resources. Any resources currently active on the node will be moved to another node. The following command puts the specified node into standby mode. If you specify the --all, this command puts all nodes into standby mode. You can use this command when updating a resource’s packages. You can also use this command when testing a configuration, to simulate recovery without actually shutting down a node. Note that when you execute the pcs node standby command, this adds constraints to the resources to prevent them from running on the indicated node. When you execute the pcs node unstandby command, this removes the constraints. This does not necessarily move the resources back to the indicated node; where the resources can run at that point depends on how you have configured your resources initially. To move all resources running on a node to a different node, you put the node in standby mode. You can use the pcs resource move command to move a resource off a node on which it is currently running. You can use the pcs resource relocate run command to move a resource to its preferred node, as determined by current cluster status, constraints, location of resources and other settings. This command calculates the preferred node for each resource while ignoring resource stickiness. After calculating the preferred node, it creates location constraints which will cause the resources to move to their preferred nodes. Once the resources have been moved, the constraints are deleted automatically. To remove all constraints created by the pcs resource relocate run command, you can enter the pcs resource relocate clear command. To display the current status of resources and their optimal node ignoring resource stickiness, enter the pcs resource relocate show command. In addition to the pcs resource move and pcs resource relocate commands, there are a variety of other commands you can use to control the behavior of cluster resources. Note that when you execute the pcs resource ban command, this adds a -INFINITY location constraint to the resource to prevent it from running on the indicated node. You can execute the pcs resource clear or the pcs constraint delete command to remove the constraint. This does not necessarily move the resources back to the indicated node; where the resources can run at that point depends on how you have configured your resources initially. You can optionally configure a lifetime parameter for the pcs resource ban command to indicate a period of time the constraint should remain. When a resource is in unmanaged mode, the resource is still in the configuration but Pacemaker does not manage the resource. The following command sets the indicated resources to unmanaged mode. The following command sets resources to managed mode, which is the default state. You can specify the name of a resource group with the pcs resource manage or pcs resource unmanage command. The command will act on all of the resources in the group, so that you can set all of the resources in a group to managed or unmanaged mode with a single command and then manage the contained resources individually. When a cluster is in maintenance mode, the cluster does not start or stop any services until told otherwise. When maintenance mode is completed, the cluster does a sanity check of the current state of any services, and then stops or starts any that need it. To put a cluster in maintenance mode, use the following command to set the maintenance-mode cluster property to true. To remove a cluster from, use the following command to set the maintenance-mode cluster property to false`. u can remove a cluster property from the configuration with the following command. Alternately, you can remove a cluster property from a configuration by leaving the value field of the pcs property set command blank. This restores that property to its default value. For example, if you have previously set the symmetric-cluster property to false, the following command removes the value you have set from the configuration and restores the value of symmetric-cluster to true, which is its default value. Rolling Updates: Remove one node at a time from service, update its software, then integrate it back into the cluster. This allows the cluster to continue providing service and managing resources while each node is updated. Entire Cluster Update: Stop the entire cluster, apply updates to all nodes, then start the cluster back up. It is critical that when performing software update procedures for Red Hat Enterprise LInux High Availability and Resilient Storage clusters, you ensure that any node that will undergo updates is not an active member of the cluster before those updates are initiated. For a full description of each of these methods and the procedures to follow for the updates, see Recommended Practices for Applying Software Updates to a RHEL High Availability or Resilient Storage Cluster. If the pacemaker_remote service is stopped on an active remote node or guest node, the cluster will gracefully migrate resources off the node before stopping the node. This allows you to perform software upgrades and other routine maintenance procedures without removing the node from the cluster. Once pacemaker_remote is shut down, however, the cluster will immediately try to reconnect. If pacemaker_remote is not restarted within the resource’s monitor timeout, the cluster will consider the monitor operation as failed. Stop the node’s connection resource with the pcs resource disable resourcename, which will move all services off the node. For guest nodes, this will also stop the VM, so the VM must be started outside the cluster (for example, using virsh) to perform any maintenance. When ready to return the node to the cluster, re-enable the resource with the pcs resource enable. This procedure is an outline of the steps required to set up a Pacemaker cluster that includes GFS2 file systems. This example creates three GFS2 file systems on three logical volumes. As a prerequisite for this procedure, you must install and start the cluster software on all nodes and create a basic two-node cluster. You must also configure fencing for the cluster. For information on creating a Pacemaker cluster and configuring fencing for the cluster, see Creating a Red Hat High-Availability cluster with Pacemaker. On both nodes of the cluster, install the lvm2-lockd and gfs2-utils packages. The lvm2-lockd package is part of the AppStream channel and the gfs2-utils package is part of the Resilient Storage channel. Set up a dlm resource. This is a required dependency for configuring a GFS2 file system in a cluster. This example creates the dlm resource as part of a resource group named locking. Clone the locking resource group so that the resource group can be active on both nodes of the cluster. Set up an lvmlockd resource as part of the group locking. If you will use GFS2 on a mirrored logical volume, you must set the with_cmirrord=1 parameter. Check the status of the cluster to ensure that the locking resource group has started on both nodes of the cluster. Verify that the lvmlockd daemon is running on both nodes of the cluster. On one node of the cluster, create two shared volume groups. One volume group will contain two GFS2 file systems, and the other volume group will contain one GFS2 file system. The following command creates the shared volume group shared_vg1 on /dev/vdb. The following command creates the shared volume group shared_vg2 on /dev/vdc. On the second node in the cluster, start the lock manager for each of the shared volume groups. On one node in the cluster, create the shared logical volumes and format the volumes with a GFS2 file system. Ensure that you create enough journals for each of the nodes in your cluster. Create an LVM-activate resource for each logical volume to automatically activate that logical volume on all nodes. Create an LVM-activate resource named sharedlv1 for the logical volume shared_lv1 in volume group shared_vg1. This command also creates the resource group shared_vg1 that includes the resource. In this example, the resource group has the same name as the shared volume group that includes the logical volume. Create an LVM-activate resource named sharedlv2 for the logical volume shared_lv2 in volume group shared_vg1. This resource will also be part of the resource group shared_vg1. Create an LVM-activate resource named sharedlv3 for the logical volume shared_lv1 in volume group shared_vg2. This command also creates the resource group shared_vg2 that includes the resource. Clone the two new resource groups. Configure ordering constraints to ensure that the locking resource group that includes the dlm and lvmlockd resources starts first. On both nodes in the cluster, verify that the logical volumes are active. There may be a delay of a few seconds. Create a file system resource to automatically mount each GFS2 file system on all nodes. The following commands create the file system resources. These commands add each resource to the resource group that includes the logical volume resource for that file system. Verify that the GFS2 file systems are mounted on both nodes of the cluster. The ideal firewall configuration for cluster components depends on the local environment, where you may need to take into account such considerations as whether the nodes have multiple network interfaces or whether off-host firewalling is present. If you are running the firewalld daemon, execute the following commands to enable the ports that are required by the Red Hat High Availability Add-On. You may need to modify which ports are open to suit local conditions. Table 15.1, “Ports to Enable for High Availability Add-On” shows the ports to enable for the Red Hat High Availability Add-On and provides an explanation for what the port is used for. Pacemaker’s pacemaker-based daemon on the full cluster nodes will contact the pacemaker_remoted daemon on Pacemaker Remote nodes at port 3121. If a separate interface is used for cluster communication, the port only needs to be open on that interface. At a minimum, the port should open on Pacemaker Remote nodes to full cluster nodes. Because users may convert a host between a full node and a remote node, or run a remote node inside a container using the host’s network, it can be useful to open the port to all nodes. It is not necessary to open the port to any hosts other than nodes. Required on corosync nodes to facilitate communication between nodes. It is crucial to open ports 5404-5412 in such a way that corosync from any node can talk to all nodes in the cluster, including itself. Required on all nodes if the cluster contains any resources requiring DLM (such as GFS2).